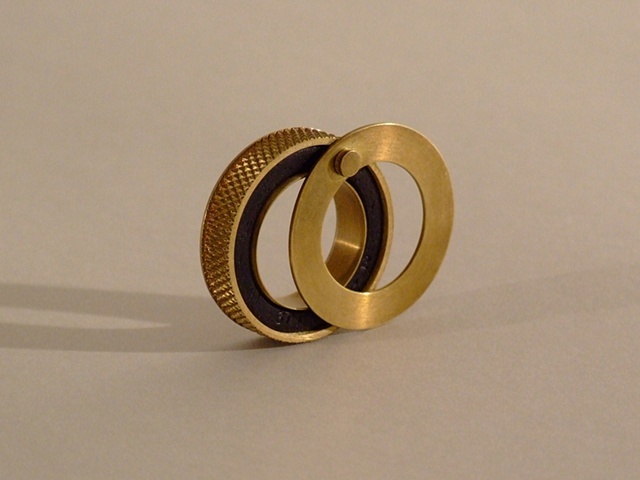 The ring has a square profile and is made from common brass with a heavy knurled (knurling is a technique that creates a diamond pattern in metals and is often used to make tool components easier to grip) texture on its sides. When removed from the hand, the top of the ring can be swiveled away to reveal a black wood inlayed into the hollow interior of the ring. The wood is stamped in two places with the numbers 2 and 3.